38" x 105" x 16"
Pi Etude. . . 3238462643383 is a direct articulation of a sequence of 13 consecutive digits from within the infinite number pi. Each of the 13 individual units is 13” wide. The value of each digit determines a unit’s height and depth. In side view, panels appear as loops in a nesting pattern. The first 7 digits of this sequence were created for a temporary exhibition in 2009. 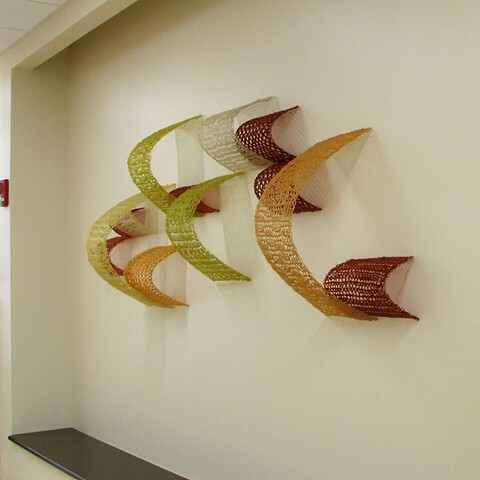 In 2012 the sequence was expanded as commission for Good Samaritan Hospital Office Building in Cincinnati, Ohio.